Back in the side scrolling beat-'em-up arcade days, around the time of the fantasy barbarian sword & sorcery movie explosion, we managed to receive a grand original arcade game that combined the two- and Golden Axe was born. Golden Axe is the hack-n-slash story of a trio coming together to defeat the evil Death Adder, who has taken control of the king's castle and laid waste to the land of Yuria- threatening to kill the rulers if he is refused the throne by the peasants. Not much in the way of story telling depth, but for the time it fit just fine. I find it a bit odd that Death Adder abducted the King and Princess. Where's the Queen? All the other castle dwellers presumably killed, I suppose. First up is Ax Battler, whose name doesn't really fit as he is a broadsword wielding, stone magic using barbarian seeking vengeance for a murdered mother. Medium in strength, speed and magic. Next comes Tyris Flare. A fire magic Amazonian armed with a longsword, looking to enact vengeance upon the killer of her parents. Weakest in strength, but fastest and most powerful with magic. Last, but not least, the Dwarf Gilius Thunderhead, whose slain twin brother will be avenged with the titular large Golden Axe and the magic of lightning. By far the strongest, but also easily the slowest and weakest magic user. The Sega Genesis port of the arcade was quite amazing in it's time. This game was filled with tons of variety. There were plenty of different attack animations, a variety of special magic potions that increase in power with number of potions, and a constant stream of enemies to battle along the path towards Death Adder himself. In addition they had beasts you could ride upon, and a mini-game of sorts at the campfire levels where you could replenish health and magic potions by beating up the looting gnomes that spawn. They felt far in advance of their time. Though the coin-op itself had better graphics and a few less levels, it felt longer. The Genesis port was also missing the 4th wall breaking ending as well if I recall correctly. Even playing with my rose-colored glasses- the game is fun despite the flaws. Yes, there are plenty of frustrating moments because this Golden Axe was designed as a quarter-muncher coin-operated arcade. They purposely made arcades to be difficult and unfair to keep you pumping quarters in for more play. 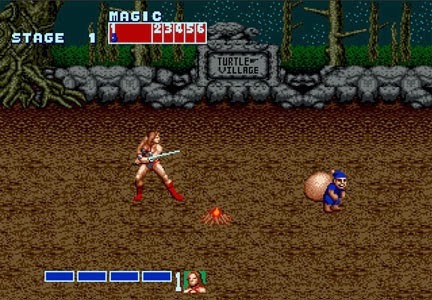 While Golden Axe doesn't hold up nearly as well as the Streets of Rage games- it is still a decent game. Honestly, I relished returning to the roots of hack-n-slash fantasy gaming. It's tough to judge this game as it is a classic, and there really isn't much for the fans of today- so due to the age of this fantasy brawler, I can only truly recommend it to fans of the series. Note: The Sega Genesis Ultimate Collection has all 3 Golden Axe games and I unlockable game that plays like The Legend of Zelda. Sega also released an Arcade Classic version that I believe had online co-op, challenge modes, and a few extras such as "Duel Mode." These versions have a few added features that give incentive to new players, and might be worth looking into.